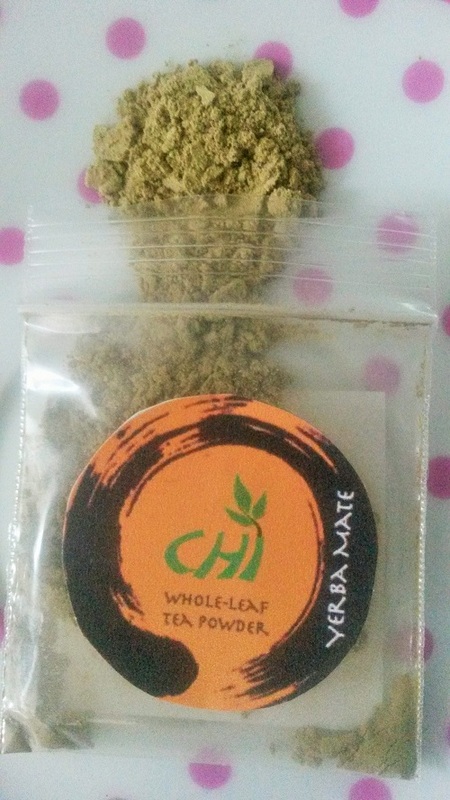 A few days ago there was a post on Steepster from Chi Whole Leaf entitled ‘Free Samples for Everyone!’. Needless to say this title caught my eye and upon opening they explain that they have sample packs to send out for people to try. 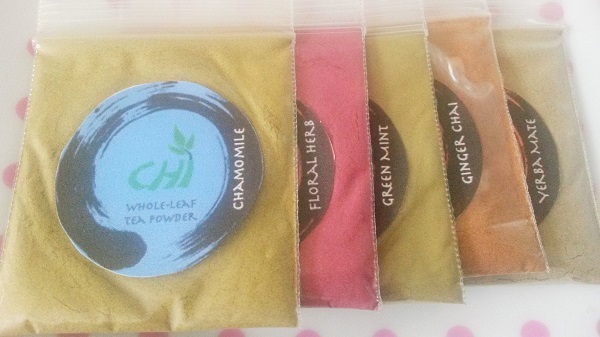 I am never one to pass down the opportunity to try free tea so I filled the application form and three days later the samples arrived through my door. From USA to UK in just three days, extraordinarily fast post! Click here to claim a sample pack (while stocks last). The envelope contained: An ‘Ingredient Guide’ for all of the samples, five small bags of tea (each clearly labelled) and a coupon for 20% off my next order. 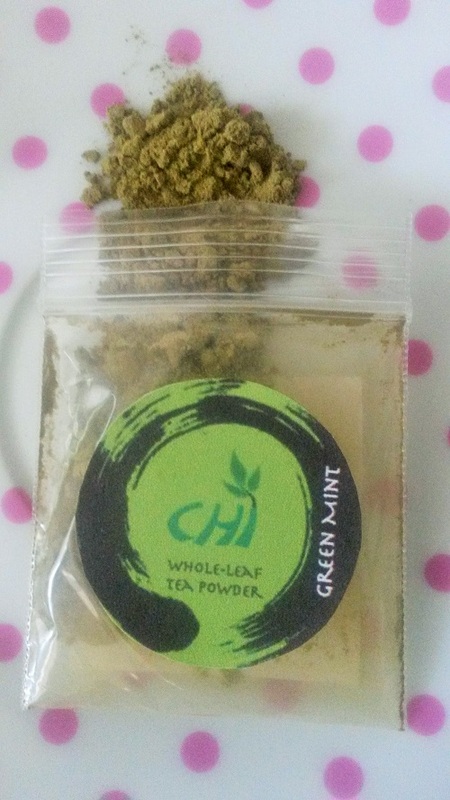 My quick glance at the tea was an interesting one, Chi Whole Leaf do powdered tea but not as we have seen before. Meaning not Matcha or Japanese powdered tea. It’s an interesting idea, something I have only seen outside of the aforementioned Japanese tea in the form of Indian spices for Chai. Yes, interesting indeed. Looking at them and reading their names ie flavours: Chamomile, Ginger Chai, Yerba Mate, Green Mint and Floral Herb, piqued my interest in the ingredients so I grabbed the guide. 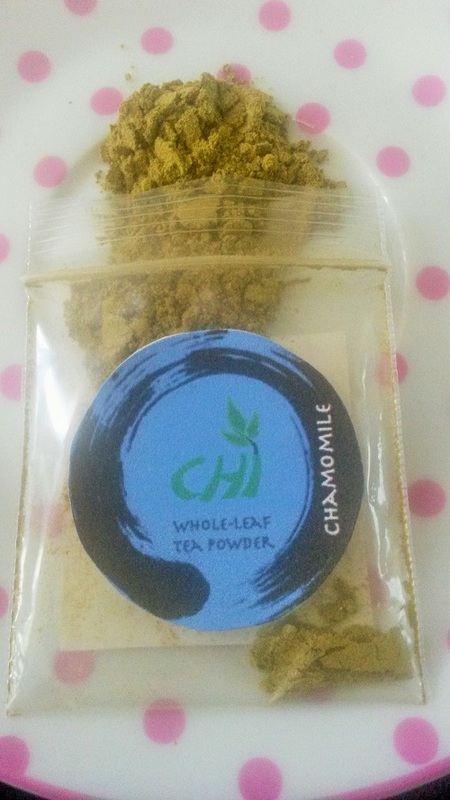 Chamomile – has been used in many cultures for stomach ailments and as a mild sedative. The chamomile flowers give the tea a nice light taste and fragrance. Peppermint – is used for common cold, cough, inflammation of the mouth and throat, sinus and respiratory infections and digestive problems. It is also a common flavour and fragrance enhancing agent. Passionflower – contains chemicals that have calming, sleep inducing and muscle spasm relieving effects. Passionflower is used for insomnia. St. John’s Wort – is most commonly used for depression, anxiety, tiredness, loss if appetite and trouble sleeping. Lemongrass – is used for treating digestive tract spasms, stomachache, high blood pressure, convulsions, pain, cough, achy joints, fever, common cold and exhaustion. It is also used as a lemon fragrance and flavour. This tea smells very herbal and dry, it’s slightly sweet. It’s blended rather well and herbal is the best I can really say. One ingredient does not stand out over the other particularly. The powder is green in colour. Once boiling water is added it has been stirred very thoroughly. The flavour is subtle but sweet with lemongrass and peppermint coming through towards the after taste. Herbal and some thickness to it which adds dryness but not too badly. 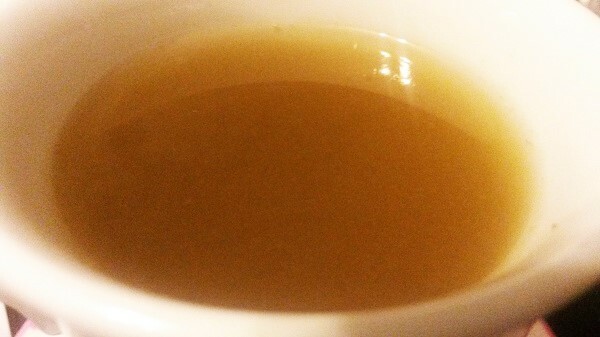 As it cools the chamomile comes through stronger as does it subtle sweetness. This carries on nicely through to the after taste. This was nice enough though I have never been a large fan of chamomile. Rooibos – has a slightly sweet and earthy flavour. It contains iron, calcium, potassium, copper, fluoride, manganese, zinc, magnesium as well as many antioxidants and polyphenols. This is caffeine free and has very little tannins. Ginger – gives the tea a spicy background. Ginger is used to treat various types of stomach problems. Other uses are pain relief from arthritis or muscle soreness. It is often used as a fragrance commercially. Cinnamon – gives the tea a rich spicy flavour. It is also used for gastrointestinal distress, appetite stimulation, infections as well as colds and flu’s. Cloves – adds an even richer flavour to the tea. It is used for upset stomachs and decongestion. This tea smells spicy, enough to tickle my nose as I sniff. The ginger and cinnamon would be the two that I can pick out, but it’s blended together very well. I can’t smell the Rooibos and would not have known if it were not in the ingredients. The powder is dark sandy brown in colour. Once steeped and stirred (very thoroughly) some milk was added. Flavour is spicy yet sweet with the Rooibos noticeable but rather light in strength. That means none of the icky chemical or ‘unique’ flavour that Rooibos naturally has. Aside from the sweetness and herbal touch of the Rooibos there is some refreshing clove present with the ginger and cinnamon adding a subtle yet still spicy kick. It’s hard to pick out the ingredients specifically as such, they all blend together very well. Compared to a tea bag this seems fresher and less dry, despite it being powdered. I also find it sweet enough with additional sweetener, which I usually have to add to my Chai. 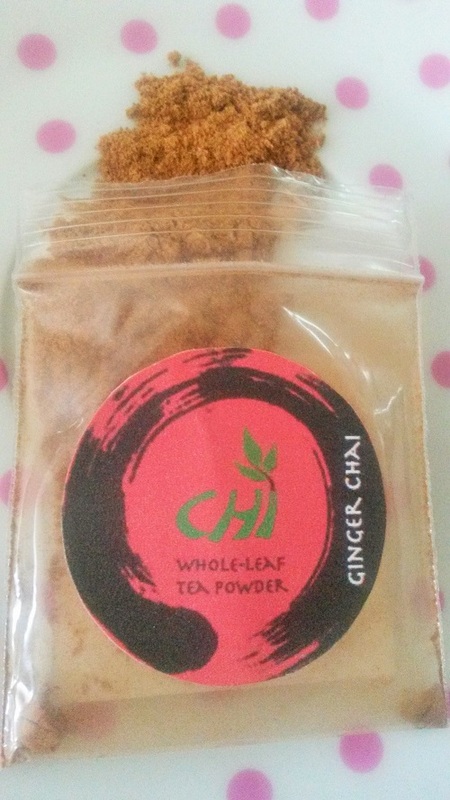 Compared to other Chai powders I have had this is more toned down in terms of strength and is lacking in terms of aromatics (cardamom etc). 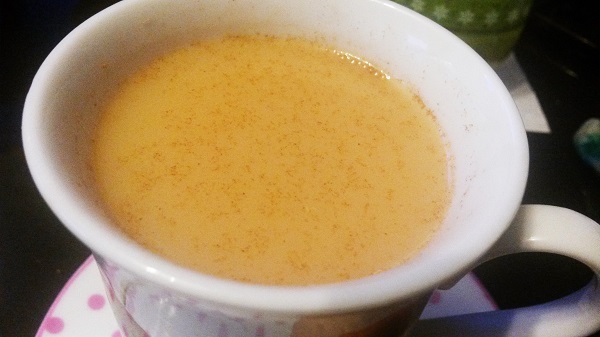 So this is a Chai but an extremely simple one at that, though for quickness and ease to make (including the idea of transportation, since this is travel handy) I am really liking this blend. So a thumbs up on this one, with a possibility of me stocking some for my personal use. 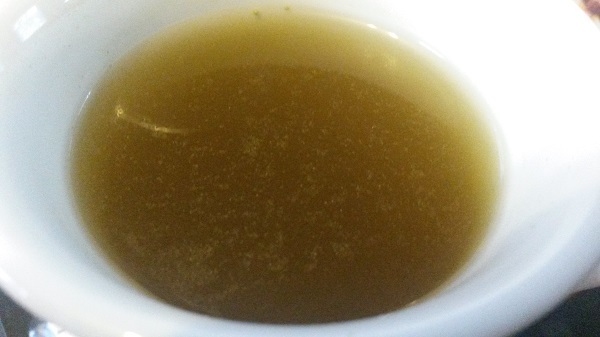 Eucalyptus Leaf – is used for infections, fever, upset stomach and to help loosen coughs. The leaf is also used for treating respiratory tract infections, whooping cough, asthma, joint pain, acne, wounds and ulcers. Darjeeling Green Tea – is known as “the champagne of teas”. 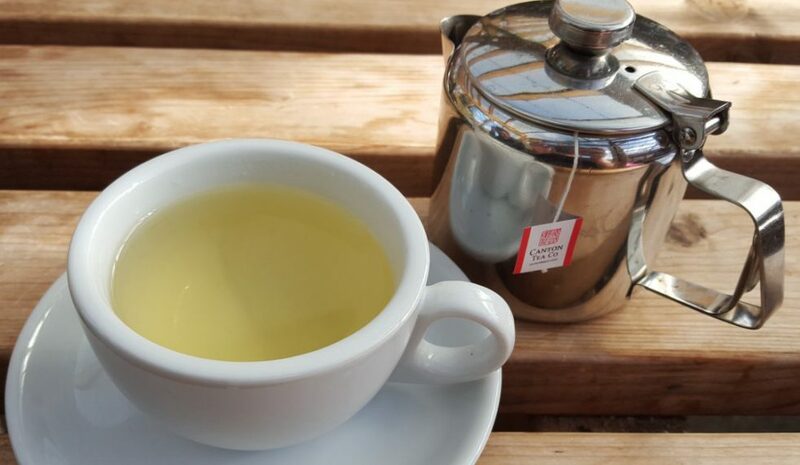 Green tea is used to improve mental alertness, weight loss, stomach disorders and headaches. The polyphenols might be able to prevent inflammation and protect cartilage. The antioxidants and other substances might protect the heart and blood vessels. This tea smells very minty and refreshing, slightly sweet but the peppermint and eucalyptus effeminately take control. The powder is dark green in colour. The flavour is mild at first but explodes with fresh mint towards the after taste with a touch of bitterness. The aftertaste is of eucalyptus and definable, it’s refreshing, warming and herbal. It’s not too thick, if anything is the strongest it’s the mint which in my opinion is never a bad thing. Compared to other brands of green mint tea (particularly those in bags) this blend is cleaner tasting though the dryness is about equal. Plus the eucalyptus makes this taste rather unique in the after taste. As it cools slightly the strength increases, the mint now adds a soft tingle to my lips as I sip. Also the bitterness increases though not too much. It was a nice blend, the eucalyptus was stronger than expected and I’m still in two minds about it but all in all it was enjoyable. I may try this one iced at some point to see the difference. 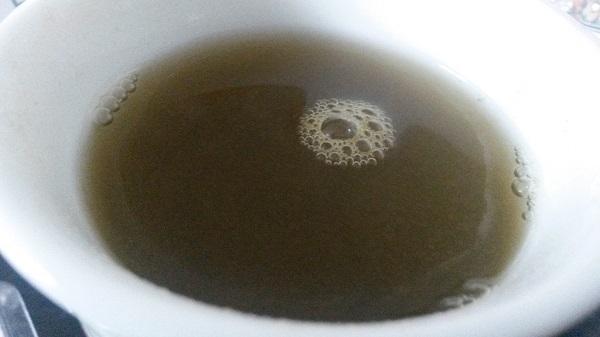 My negative point is that I could not really taste the green tea very much, and I feel I should have considering it’s a Darjeeling green. Rose Petals – give the tea a fragrant aroma and give it a lighter more delicate taste. Hibiscus – is used for loss of appetite, colds, heart and nerve disease, upper respiratory tract pain and swelling, fluid retention, stomach irritation and disorders of circulation. It gives the tea a tart and fruity taste. Jasmine – has been used for liver disease, abdominal pain and for relaxation. It is also used to add a fragrance to commercial products. This tea smells sweet and sour which must be the hibiscus dominating over the rose and jasmine. It is a little floral but not enough for me to pick them out especially. 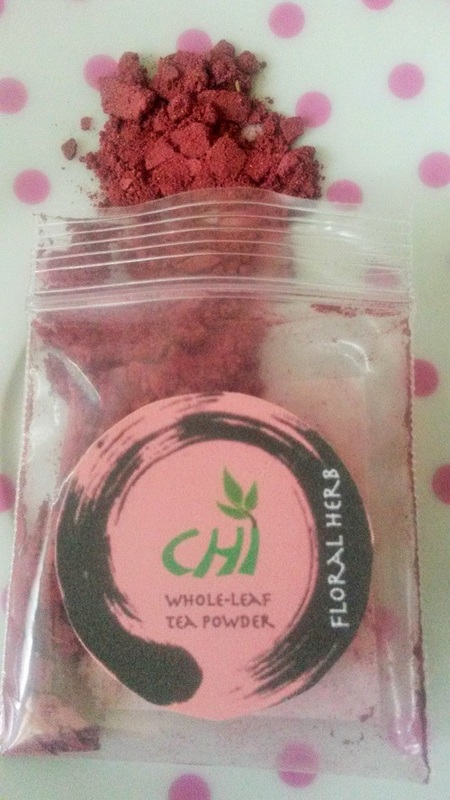 The powder is red in colour. Flavour is mild but sweet and slightly tart. There is some dryness along with a generic herbal taste with little to no after taste. The tartness from the hibiscus is only mild and does not last long. On the whole grand scheme of things this blend is much more mild than I was expecting but at the same time I like that. Reason being I think it would translate well to iced tea, which it does say you can use cold water for this blend. As it cools the flowers pop up with more sweetness, pure tasting ie clean though still subtle. Still a little dry but it hasn’t increased. This blend was the one I was most wary of since I dislike hibiscus but due to it’s mild nature I found it rather pleasant. I’ve been trying to go ‘caffeine free’ a lot recently and this was a nice example. Finishing this sample will be no problem. Mate – is used as a stimulant to relieve mental and physical tiredness. It is also used for heart related complaints. Some people use mate to improve mood, relieve headache and improve weight loss. Licorice Root – is used for various digestive complaints as well as throat complaints. It also may improve the function of the adrenal glands. The adrenal glands produce important hormones that regulate the body’s response to stress. Ginkgo – seems to improve blood circulation, which might help the brain, eyes, ears and legs function better. It may slow down Alzheimer’s disease by interfacing with changes in the brain that interfere with thinking. This tea smells sweet and herbal, with the licorice being the strongest. It’s refreshing and rather light. The powder is khaki in colour. Flavour is thick and very sweet, the licorice root grabbing my taste buds and taking them on a refreshing ride. The Mate is lightly herbal though it gets lost behind the sweet, refreshing (and overpowering) licorice and ginkgo. It has a long after taste, it’s sweetness clinging to my tongue. I admit I’m not a fan of licorice tea in general, but this was drinkable. More than that I believe the Mate has worked somewhat to boost my energy. 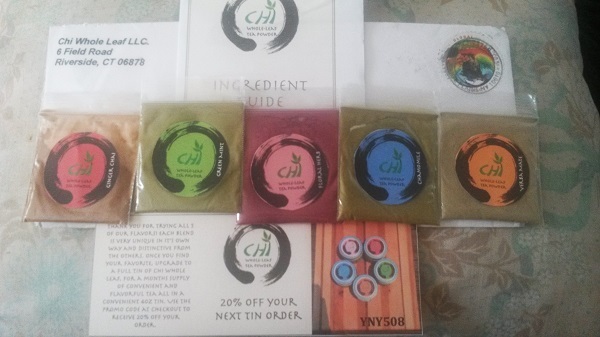 While I am very thankful that Chi Whole Leaf sent me samples to review I will also be honest and say that these may not be for me. 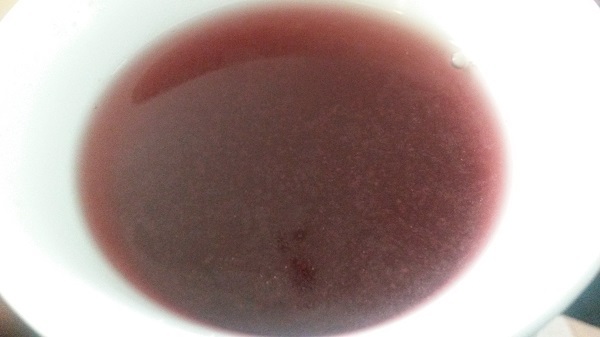 Powdered tea and tisane in general (outside of Matcha) is a little strange, and no matter how much I stirred the bottom of the cup always had powder in clump form. Even with use of a sieve they bared no better. On the grand scheme of things I would say they are a step up from teabags but not as good quality as loose leaf. Though the Ginger Chai made the exception for me and I will be considering purchasing some of that, though again it was not ground breaking in terms of Chai. But please remember that these are personal reviews, what one person may like does not mean another will…and vice versa. At any rate I can finish my samples with ease and I appreciate the herbal benefits they may have. So, until next time friends. Happy Steeping! Previous Post Tg Bottled Iced Green Tea – A way To Beat This Heatwave! I think your conclusion is in line with what I thought at first when reading your test and the powdered tea thing.